"First Highway Machinery for Ocracoke Island – Isolated Ocracoke Island on North Carolina’s Outer Banks receives its first road-building machinery in history from Gov. Kerr Scott. 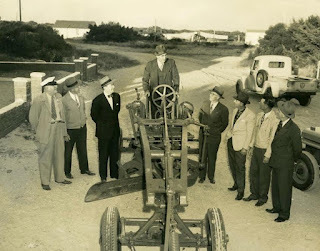 He and a group of state officials visit the 18-mile-long island jutting out into the Atlantic ocean and present the machine to the island’s road committee…. "Ocracokers are not required to have state license on their automobiles since there are no state roads on the island. But they are glad to swap that distinction for all-weather roads to replace the sand trails. These roads will be built as part of the state’s $200,000,000 rural road program." Seven years ago Tommy Drake, grandson of Capt. Gary Bragg, showed me a mid-1950s paper with directions for getting to Ocracoke. Charter plane by arrangement, from Beaufort, Buxton, Manteo, or Washington, N.C.
You may have noticed that driving one's own vehicle from Hatteras is not included. The paper even includes these words, in parentheses: "Don't let yourself be persuaded to attempt the trip in your own car unless you know what your are doing."!! I thought our readers would enjoy seeing this photo by Eakin Howard. He took the picture last week near midnight. You can read about Eakin and his photography here: https://www.eakinhoward.com. If you explore many of Ocracoke's old family cemeteries you will eventually stumble upon some unusual first names. Across from Village Craftsmen you will see the graves of my great-grandparents, James Howard and his wife, Zilphia Grey Williams Howard. 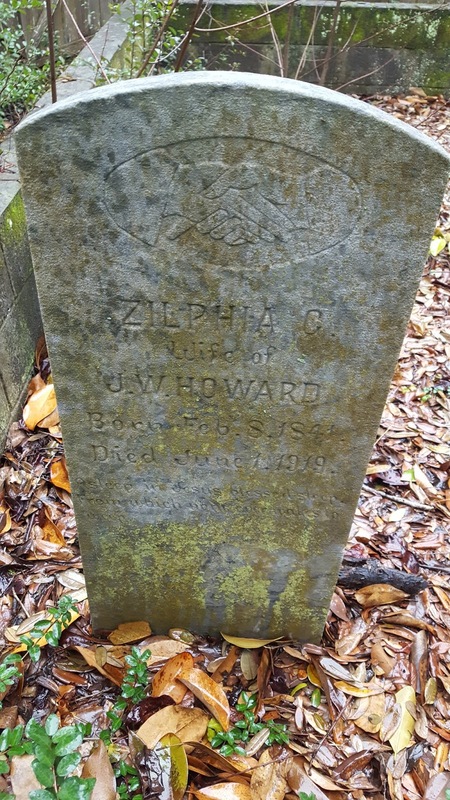 Zilphia was born in 1841, one of eight children of Sarah O'Neele and Joseph Williams. Two of Zilphia's sisters (Cordelia and Elizabeth) married two of James' brothers (Enoch Ellis and Perry Coleman). Zilphia is an uncommon name. In 1888 28 of every one million baby girls were named Zilphia. By 1950, only 4 in a million were named Zilphia. I have no figures for recent years, but I feel confident it is even fewer nowadays. Zilphia (sometimes Zilpha) is a biblical name of Hebrew origin. The name was revived in English-speaking areas in the 18th century and was somewhat popular in the 19th century. It is a variant of Zilpah. In the Hebrew scriptures, Zilpah is the handmaid of Jacob's wife Leah, and mother of Jacob's children, Gad and Asher. 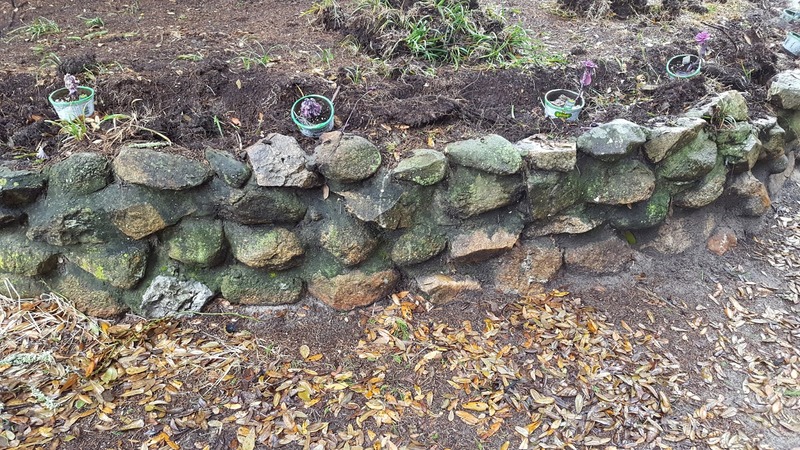 There are no indigenous rocks or stones on Ocracoke Island...just sand. However, visitors to the island may notice football-size rocks in local yards and gardens. These rocks may also occasionally be found under water or along the sound shore. They are ballast stones. ballast is "a heavy substance employed to give a ship sufficient hold on the water to give her stability." 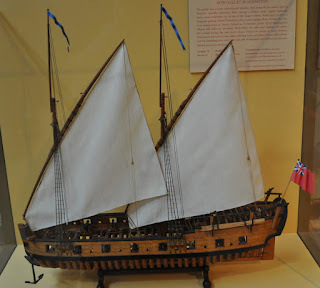 During the Colonial Era sailing ships left North Carolina loaded with lumber, shingles, tobacco, and other goods, but, because there was only a limited market for manufactured goods in coastal North Carolina, incoming ships carried ballast, usually rocks or stones. Of course, the ballast needed to be thrown overboard before loading outbound cargo. According to William S. Powell in, NCPedia, "[j]ettisoned stones began to clog the harbors so badly that in 1769 North Carolina political leader Richard Caswell presented a bill in the colonial Assembly to appoint a ballast master who would regulate this activity in the vicinity of Ocracoke Inlet. 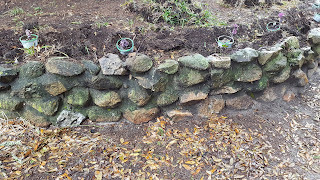 The problem persisted, however, and in 1784 the General Assembly passed an act that prohibited ballast stones from being thrown into the channel of the Cape Fear River. Thereafter, before docking, ships were required to dispose of their ballast prior to reaching the low watermark." 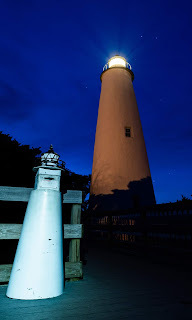 Two days ago I published this photo of the Ocracoke Lighthouse by my grandson, Eakin Howard. 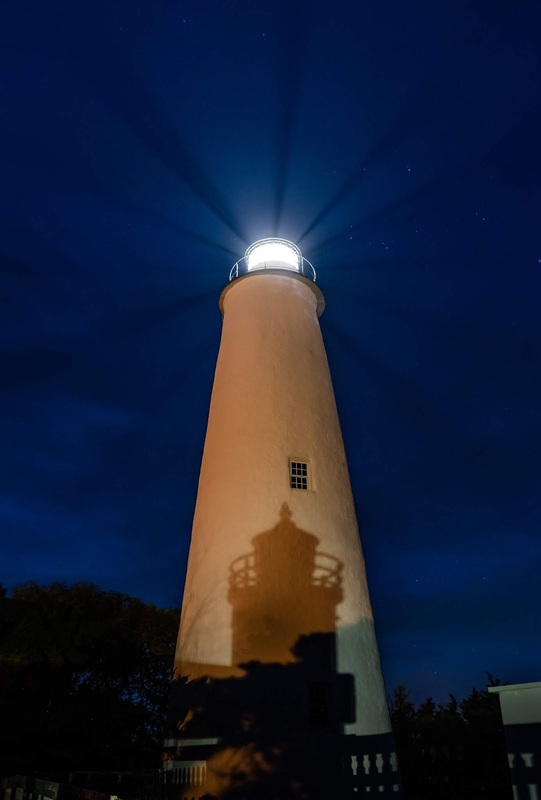 I asked if any of our readers could explain how he got this unusual photo with a shadow of a lighthouse on the lighthouse itself. The shadow on the side of the lighthouse is of the small metal lighthouse-shaped donation box mounted on the boardwalk! At first I thought the moon was the light source, but Eakin told me the light came from his headlamp. Today UPS, FedEx, and the United States Postal Service provide regular package delivery to Ocracoke Island. Estes Express Lines, based in Richmond Virginia, also periodically delivers larger items to the island via tractor-trailer trucks. Before ferry service was established it was difficult to get large items to Ocracoke. "There as been some talk recently by those who could make it possible, to establish a daily freight and express boat line from Beaufort to Ocracoke Island where it could very easily connect with the over-beach bus to Hatteras Island. The Beaufort Chamber of Commerce which under its present leadership has never operated on a strictly local basis, but for the Central Coast at large, is ready to help make this possible through any promotional means. The Beaufort – Morehead City Railroad Company under its present management is also considering the various angles which would make this possible – a through freight service connecting with the daily trains into Beaufort from Morehead City, eastern terminus of the A.& E. C. Railway Company and thence through Core Sound connecting with the various communities of East Carteret and terminating at Ocracoke Island. Such a plan may not operate profitably at the beginning but in the long run it would be a most worth-while investment for the firm that undertakes it. That is because the Outer Banks and Ocracoke in particular are just beginning to develop. A through freight and express service would be of great benefit to every community east of Beaufort where there are no express or freight agencies at present. It is a matter well worth considering and Beaufort stands ready, we believe, to support any such proposition undertaken by any firm or organization." It is interesting to note that the freight service was conceived as connecting first to Ocracoke, and from there to more remote areas via an "over-beach bus to Hatteras Island," since "Ocracoke in particular" was "just beginning to develop." 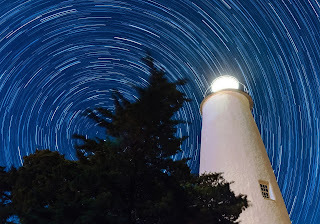 My grandson, Eakin Howard, made this unusual photo of the Ocracoke lighthouse a few days ago. The photo has not been manipulated in any way, nor did Eakin bring any props or make any alterations to his camera lens. If you think you know how my grandson got this striking image of the lighthouse with the shadow, please leave a comment. I will reveal this answer in a few days. Most visitors to Ocracoke fall in love with our plain white lighthouse that casts a steady beam. 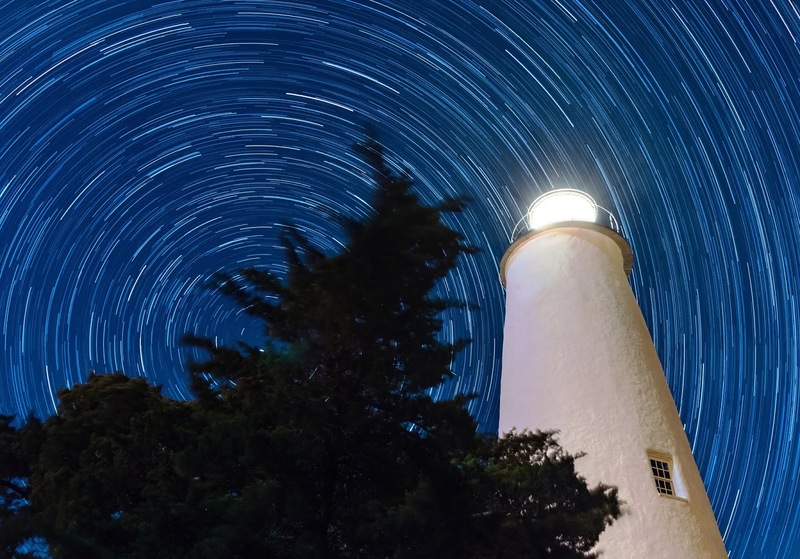 Few people know that the Ocracoke light was a revolving light until 1854. 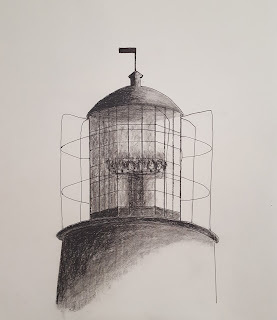 Also, from the time of its construction in 1823 until 1854, when a Fresnel lens replaced the old reflecting/illuminating apparatus, the lantern room was a taller octagonal structure with a "birdcage" design. Our latest Ocracoke Newsletter is a history of the Ocracoke Lighthouse, with information about the earliest lantern room. You can read the Newsletter here: http://www.villagecraftsmen.com/ocracoke-lighthouse/. Nowadays, we're told, this is a whelk, not a conch. In fact, in 2015 Terri Hathaway wrote an informative article in Coastwatch Currents explaining the difference (and bemoaning the confusion). 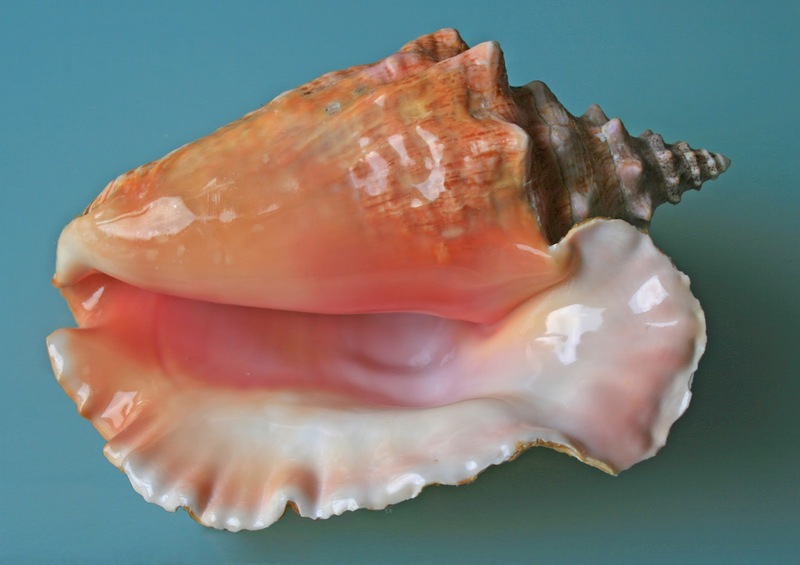 You can read it here: https://ncseagrant.ncsu.edu/currents/2015/03/whats-in-a-name-conch-vs-whelk/. Wikipedia explains that a conch "is a common name that is applied to a number of different medium to large-sized shells. The term generally applies to large snails whose shell has a high spire and a noticeable siphonal canal.... The group of conchs that are sometimes referred to as "true conchs" are marine gastropod molluscs in the family Strombidae, specifically in the genus Strombus and other closely related genera." A whelk, on the other hand, "is a common name that is applied to various kinds of sea snail [that] are relatively large and are in the family Buccinidae (the true whelks)...."
"There is no human society without gossip," according to anthropologist, Pascal Boyer, in his 2001 book, Religion Explained. "Gossip is practiced everywhere, enjoyed everywhere, despised everywhere," he explains. Ocracoke, like many other small towns, has its fair share of gossip. Gossip can be defined as casual conversation or reports about other people. Although gossip is sometimes despised for being mean-spirited, especially when the shared information turns out to be false, Boyer reminds us that "gossip is perhaps among the most fundamental human activities as important to survival and reproduction as most other cognitive capacities and emotional dispositions." Gossip, information about other people, Boyer reminds us, "is a resource...not to be squandered." It helps us recognize members of our tribe who are trustworthy and cooperative (and who are not), and without such knowledge we would not have stable social interactions. One native islander summed up Ocracoke's usually non-judgemental gossip in what has become an unofficial island motto: "We don't care what you do, we just want to know about it!" "Buck" is a common island word meaning pal or friend, and is used as a form of greeting, typically between men, as in the expression, "Hey Buck, how's it going?" (Buck is undoubtedly of ancient origin, from the word"bucca" (male goat) and "buc" (male deer), that in 18th century England came to mean "dashing fellow.") To my knowledge, Buck is a term unique to Ocracoke Island. "Puck" is used locally as a diminutive of Buck, and is generally used to address women, and children, or by women to address men...and sometimes implies a degree of impishness. In Shakespeare Puck is a jovial, but pranksterish wanderer of the night. 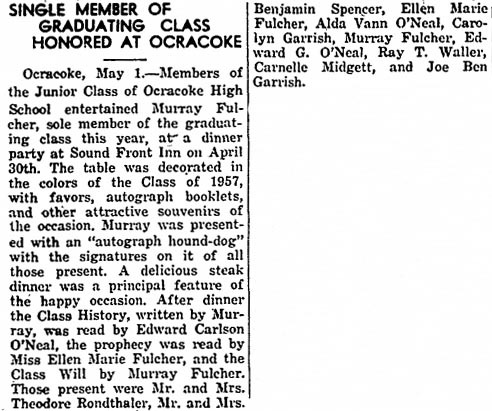 I think it's a good guess that the early British settlers on Ocracoke brought with them both terms, Buck & Puck. Died Before He Was Born? 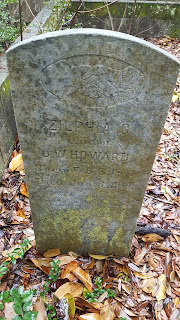 In the right front row of the old George Howard Cemetery on British Cemetery Road are the graves of Eliza Howard Wahab and Job Wahab. Next to them are the graves of several of their 15 children. A few graves in particular are of special interest. 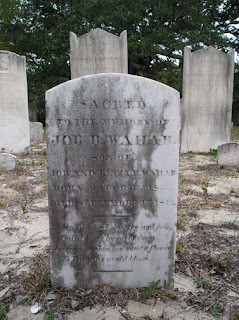 In his 1956 book, Ocracoke, Carl Goerch includes a chapter entitled “Died Before He Was Born.” He refers to the gravestone of Warren Wahab, son of Eliza and Job Wahab. According to Goerch, the inscription states that Warren was born in 1855 and died in 1842. 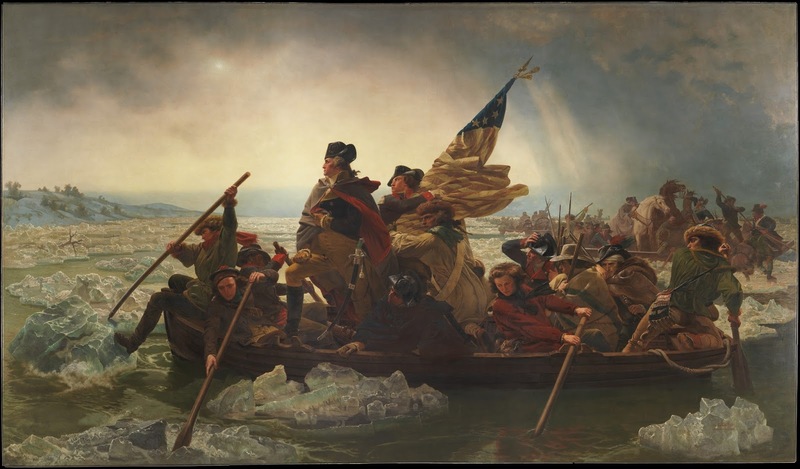 If you look along the front row you will notice that Warren was one of three of Eliza and Job’s children who all died within seven days in September of 1842. Job died on September 4. He was seven years old, having been born in 1835. Jonathan and Warren died on September 11. A glance at the tombstones will show that both Job and Warren appear to have been born in 1855. Careful inspection reveals, however, that Job was actually born in 1835, and Warren was born in 1833. Over time the 3s have weathered to look like 5s. The difference is most noticeable on Job’s marker. No stonecutter made any mistake. Several years ago I had the opportunity to peruse the Wahab family Bible. Sure enough Warren’s birth date was listed as 1833, and Job’s was 1835. But Goerch’s story is still bandied about by folks even today. I suppose it does make an entertaining story. A 1998 edition of Ocracoke Preservation Society's Fall Newsletter, The Mullet Wrapper, included a page of information by Ellen F. Cloud (1940-2016) titled "Mariners of the American Revolution." Ellen Cloud listed 44 sailing vessels that "were captured by the British, and the crews taken and held as prisoners" between 1771 and 1782. The Newsletter's editor noted that "[several vessels] were known to have been local to our area. ...Ocracokers were among those listed as crew members.... Notice also, that some of the prisoners such as William Howard [and three others] escaped and eventually made it back home. What a story that must have been!" Yesterday I mentioned that a large row galley was stationed at Ocracoke Inlet during the Revolutionary War to guard American shipping from attacks by the British. The name of the vessel is not recorded. Some of our readers might wonder what a row galley is. A row galley was an armed United States Navy vessel employed during the age of sail. As the name suggests, row galleys used oars rather than sails as their primary means of propulsion . While sailing ships might be slowed down (or even halted) because of lack of wind, row galleys were able to continue to move as long as the crew could endure. 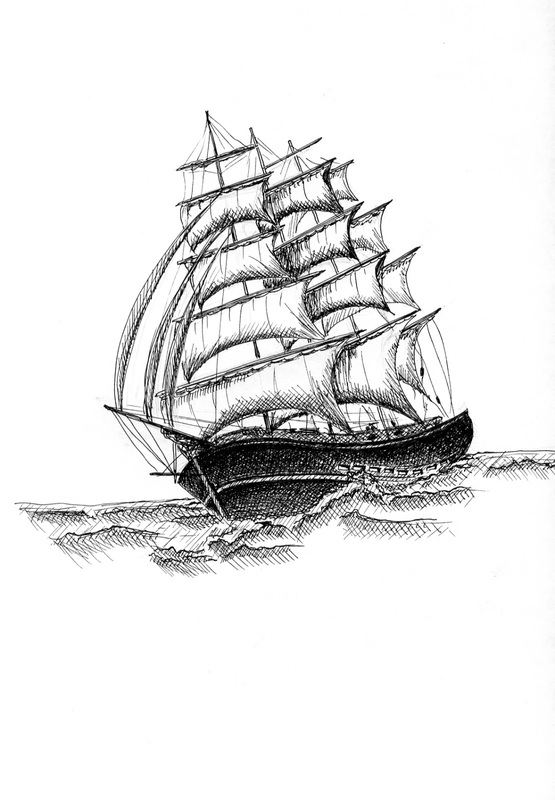 Some row galleys also employed sails, making them even more versatile. 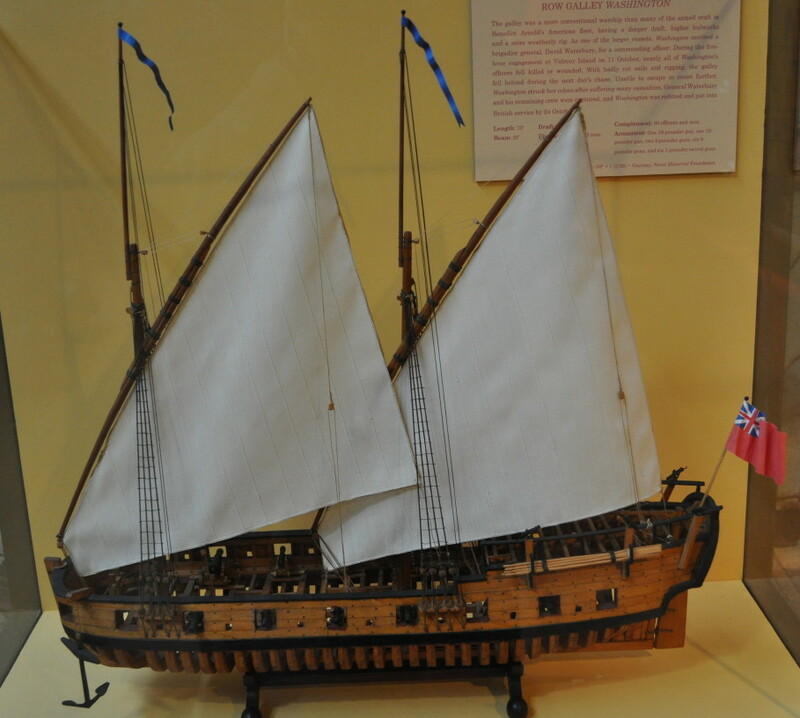 Above is a model of the Revolutionary-era row galley, USS Washington. This row galley had a complement of 60 oarsmen. "During the Revolutionary War, British vessels frequently raided shipping in [Ocracoke] inlet. Before regular defending forces were sent there the Ocracoke pilots captured several of these armed vessels; later a militia company and a large row galley were stationed at the inlet to guard American shipping, and supplies destined for Washington’s army at Valley Forge were brought in through Ocracoke Inlet at that time." A 1986 CAMA Land Use Plan lists eleven "specialty shops" on Ocracoke. One of them is "Our Creations." 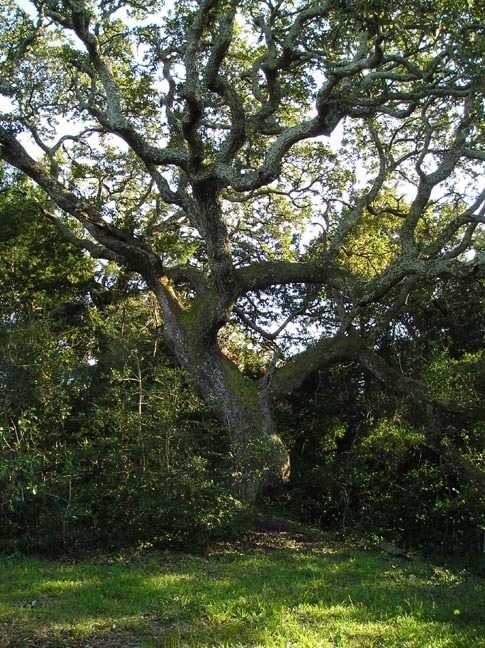 A local newspaper article described the business as located on a narrow lane "shaded by live oaks and fragrant mimosas." The shop "offers items handcrafted with love and care by more than 40 island residents" and is housed in a "weathered clapboard cottage, once a private residence." The cottage "features three showrooms displaying pottery, woodcrafts, quilts, stenciling, jewelry and paintings." Do any of our readers remember Our Creations? And do you remember where it was located? This month's Ocracoke Newsletter is the story of Ocracoke Lodge No. 194, Independent Order of Odd Fellows. You can read the Newsletter here:https://www.villagecraftsmen.com/island-inn-lodge-no-194-independent-order-odd-fellows/. "Down on Ocracoke there's a burial association which ... is not operated by any undertaker or funeral home because there are no undertakers or funeral homes. There are no monthly dues. It's a community proposition entirely. "...The annual dues are ten cents a year.... Practically everybody on the island belongs to the association.... When a member dies it means that all the other member have to pay a quarter..."
To this day there is still no undertaker on the island. However, Twiford's Funeral Home on Hatteras now serves Ocracoke. 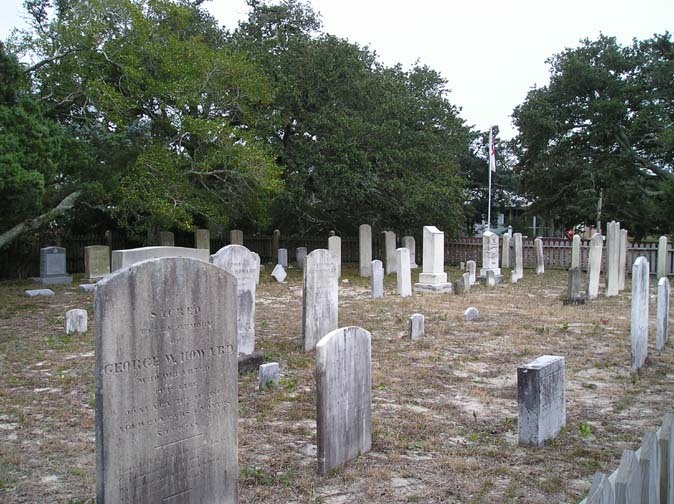 Also, the Ocracoke Burial Association continues to serve about 350 islanders, although the annual dues and payments at the death of members are now 50 cents. This month's Ocracoke Newsletter is the story of Ocracoke Lodge No. 194, Independent Order of Odd Fellows. You can read the Newsletter here:https://www.villagecraftsmen.com/island-inn-lodge-no-194-independent-order-odd-fellows/ . The following detail from Coast Chart No. 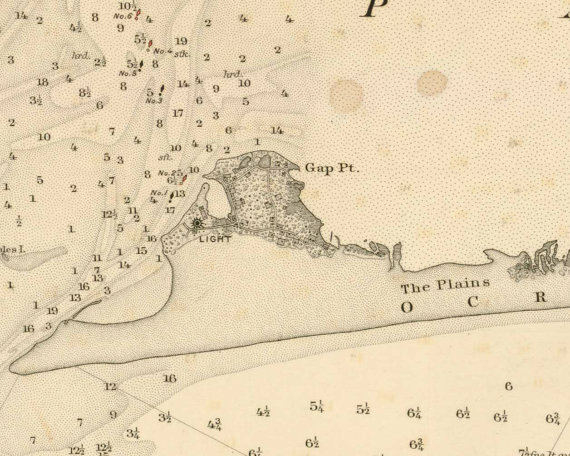 45, Cape Hatteras to Ocracoke Inlet, 1885, clearly shows a large area of tidal flats called "The Plains." Today that area (from the eastern edge of the village to the NPS campground) is covered with sea oats, yaupons, cedars and other vegetation. For much of Ocracoke's history, and as late as the mid-1950s, the Plains were almost totally devoid of vegetation, and subject to frequent tidal overwash. Only with the construction of a continuous row of man-made barrier dunes did growth take hold in this area. Visitors to the island sometimes ask why our lighthouse is so far from the ocean. Click on the image to see a larger version of the chart. Notice how close to the lighthouse the Plains area extends in 1885. 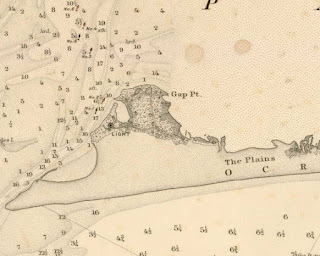 When the lighthouse was built in 1823 it was situated on the very edge of the "bald beach." My daughter, Amy Howard, wrote the following short piece for the Ocracoke Preservation Society when she was the Society's Administrator. I thought it was appropriate now since our lawns are covered with live oak leaves. My father, Lawton Howard, moved from Ocracoke to Philadelphia in 1927. He was just sixteen years old. 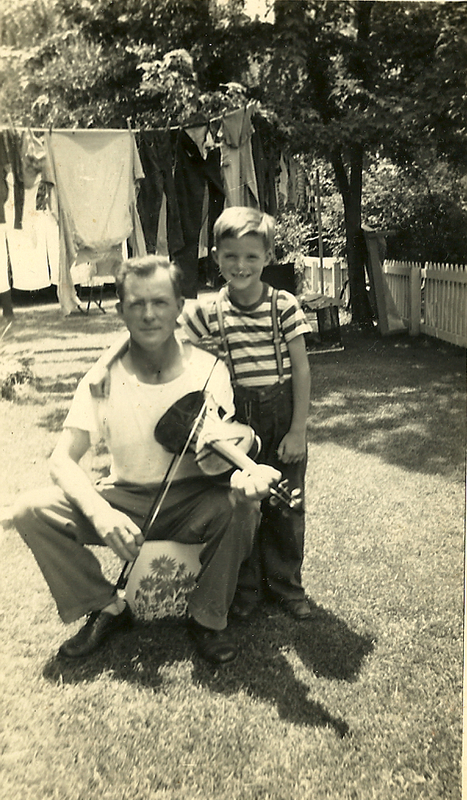 Like so many other young island men, he moved north to work on dredges and tugboats with the US Army Corps of Engineers. 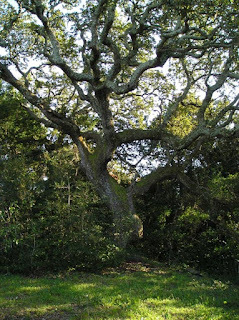 Although Lawton married and raised his family in Pennsylvania, he always maintained a strong connection with Ocracoke. Every summer he returned with his family to the island, and he kept in touch throughout the year. Soon after telephones were installed on the island (in the mid-1950s) Lawton placed a call to one of his cousins, but he was connected to a wrong number. In those days with real, live operators, Lawton called to report the mistake and to have the charge removed from his bill. After he explained the mistake to the operator she pointed out that the call to the "wrong number" had lasted fifteen minutes. Lawton immediately explained that it was a wrong number, but, as it turned out, he knew the person who had answered (of course he did; it was Ocracoke) so he couldn't just hang up! I don't remember if the operator removed the charge or not. This month's Ocracoke Newsletter is the story of Ocracoke Lodge No. 194, Independent Order of Odd Fellows. You can read the Newsletter here: https://www.villagecraftsmen.com/island-inn-lodge-no-194-independent-order-odd-fellows/ . For the past several years Amy and I have been sharing stories in April with eighth graders from Monroe, NC. Like most schools these days, the senior class has t-shirts printed with all the names of the year's graduates. That could be 300 or more students, they tell me. Then I hold up a similar t-shirt from the Ocracoke School. Printed on the shirt, front and back, are the names of everyone who ever graduated from the school, from 1931 to the present! I like to hand the shirt to one of the eighth graders and ask him or her to read off all the graduates in 1957. "Murray Fulcher," they say. "Go on," I prompt. "There aren't any other names," they reply. This year Ocracoke School will have 5 graduates. Brian Aherne (1902 – 1986) was an English actor of stage and screen who made his debut on Broadway in 1931, playing opposite Katharine Cornell. Two years later he went to Hollywood and secured a role in Song of Songs with Marlene Dietrich. In the course of his career he played or starred in 45 films, 14 television shows, and several radio programs. In 1940 he was nominated for an Academy Award as Best Supporting Actor in Juarez. 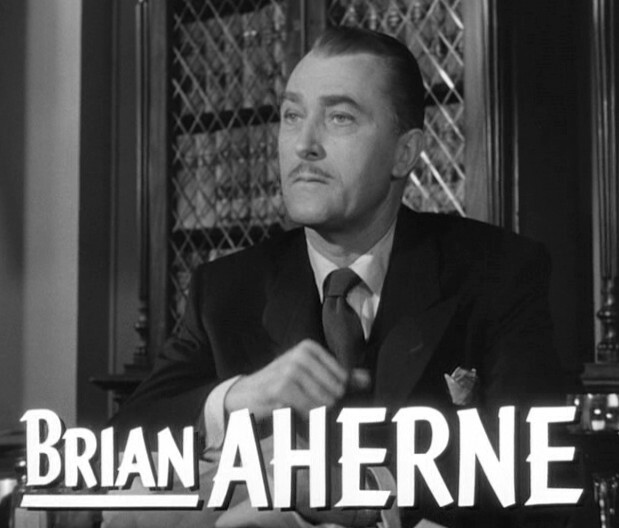 From 1939 to 1945 Aherne was married to Joan Fontaine (1917 – 2013), a British-American actress best known for her starring roles in Hollywood films. 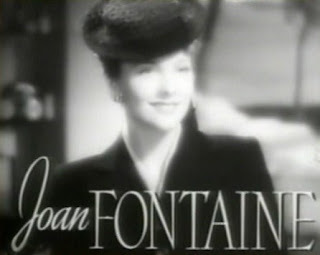 Fontaine appeared in more than 45 feature films in a career that spanned five decades. In 1941 she won an Academy Award for Best Actress in the film Suspicion. It was one of several awards. 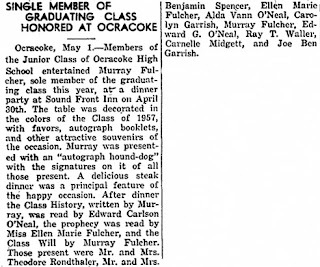 An August 21, 1941, newspaper article from Beaufort, NC, notes that "among the guests who registered at [Ocracoke Island's] Wahab Village Hotel last week were...Mr. and Mrs. Brian Aherne of Beverly Hills, Calif., the famous movie stars." Brian Aherne and Joan Fontaine are not the only celebrities to have found their way to Ocracoke. I know, or have heard, that the following famous people have visited Ocracoke: John Dos Passos, Charles Lindbergh, George Hamilton IV, Nicole Kidman, Ellen DeGeneres, Robert Plant, Tom Cruise, Michelle Pfeiffer, Johnny Depp, Kevin Costner, Sean Connery, and Jimmy Buffett. One islander, when asked if any of the men at the Life Saving Station were aware that well known author, John dos Passos, had visited them, replied, "Probably not, and even if they did know they wouldn't have been much impressed. O'cockers never treated anyone any different just because they were famous."